Striped stones benefit from careful layout. Because of their distinct patterns, the exact layout and placement of each piece of stone is extremely important. Ideally, the stripes will flow across seams and angle around corners in a pleasing way. Additional materials or slabs might be needed to ensure the best fit. It will take some thoughtful layout, careful templating, and skilled fabricating. The result will be magical! A striped stone makes a statement. 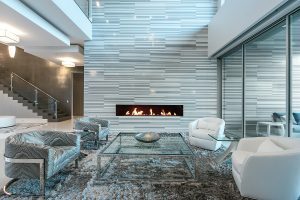 With all the materials that imitate natural stone, none of them have captured the way natural stone tends to form in rhythmic layers. 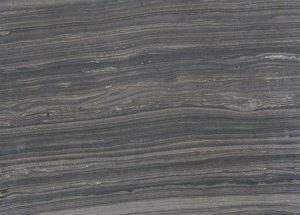 Striped patterns in stones are usually caused by layers of sediment that have accumulated over time. If you’ve ever stood on the rim of the Grand Canyon, you know exactly what I mean. You can appreciate the vast procession of rock layers, laid down by former beaches, tropical coral atolls, sweeping rivers, and muddy floodplains. Much of Earth’s history is recorded in layer upon layer of sediment. This is one of the fundamental concepts of geology. When a layered rock is quarried and sawn into blocks, its layers look like stripes. They can be subtle or vivid; straight, wavy, or chaotic. 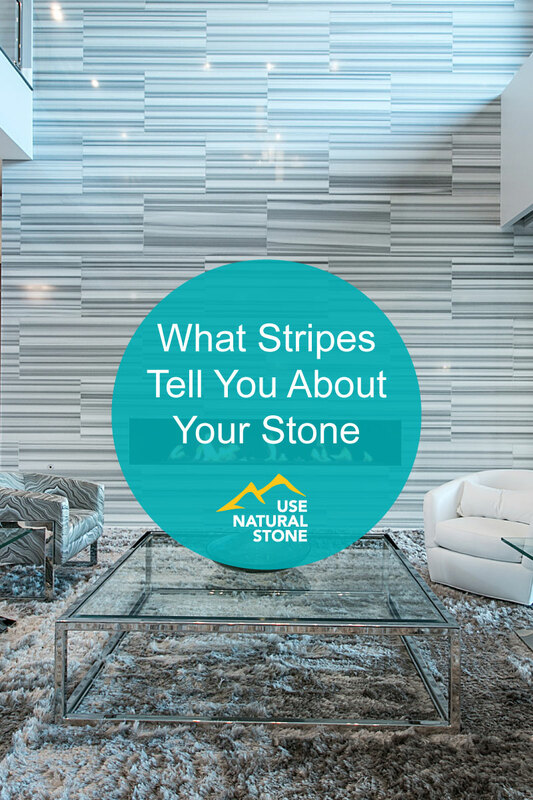 Bringing a stone with stripes into your home does two things: it creates a stunning visual, and it serves as an ongoing reminder of how your natural stone has recorded the passage of geologic time. Eramosa limestone. Photo courtesy of Owen Sound Ledgerock. Most sedimentary rocks are layered, with each layer representing some interval of geologic time. There’s no standard for how much time is encapsulated within one layer. In deep ocean basins, sediments accumulate at the unimaginably slow rate of a half-inch every thousand years. But during a flood, several feet of sand and gravel can be deposited in a single day. Stones that have very regular, repeating layers of similar size tend to be formed by cyclic events like seasons, tides, or small floods. 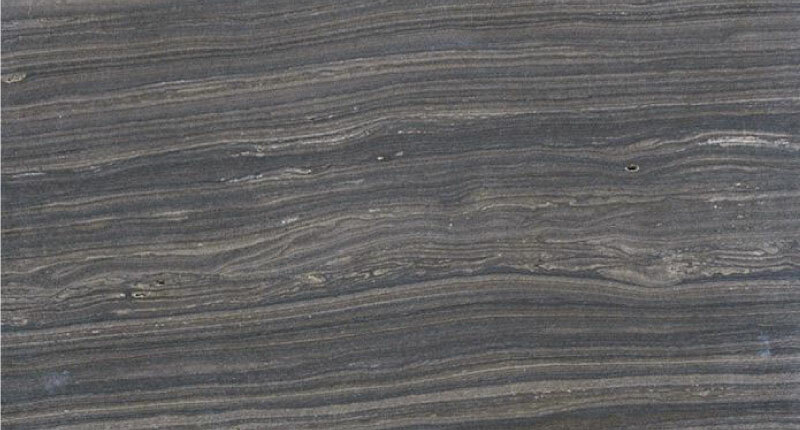 Eramosa Limestone is one example of a stone with a repeating pattern of brown and tan stripes. 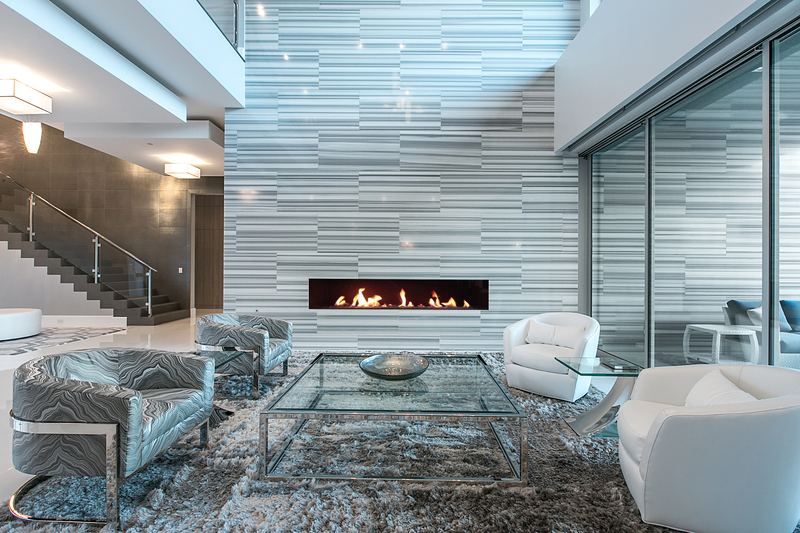 The stone’s rich color and subtle, warm stripes are evocative of a rich wood grain. Eramosa is quarried in Ontario, Canada and the stone is limestone. The stripes are flat, hinting that they formed in a setting with calm water and not a lot of currents. The alternating layers in the stone are made of dark brown limestone and lighter tan limestone. The darker brown layers contain more clay and the light tan layers are made mostly of calcite. The clay layers may have been caused by seasonal fluctuations or other changes in water circulation. Eramosa Limestone is most commonly used as “vein cut” which means the stone is sliced perpendicular to the layering. This produces slabs with straight stripes. For a more organic look, “fleuri cut” (also called cross cut) slices the stone along its layers, like cutting away just the top layer of a birthday cake. Cutting the stone in this direction enhances the slight waviness in the layers, giving the slab a distinctly different aesthetic. Striato Olympico marble. Photo courtesy of The Tuscany Collection. Striato means “striated” or “streaked” in Italian, and what is most striking about this gorgeous stone is how dead flat the layers are. The alternating bands are stark in their geometric perfection, but softly diffused in their grey and white coloring. The overall effect is crisp and tidy, while also incorporating two of the most popular colors for kitchens and baths. 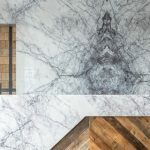 This stone is a clever way to bring traditional marble into a contemporary design. That said, this stone is a bit of an outlier, geologically speaking. 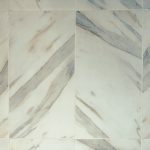 The marble we have come to know and love is characterized by swirls and flowing ribbons of color. How’d this one end up so straight-laced? Marble, as you probably know, is a metamorphic rock. It’s a heated, squeezed, and recrystallized version of limestone. 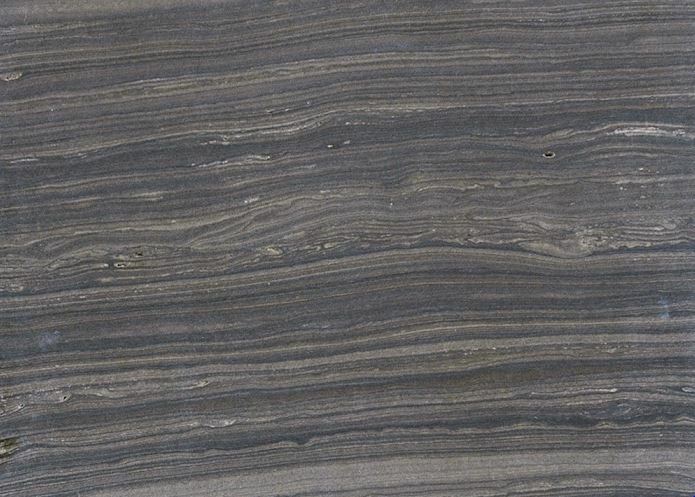 The grey bands in Striato or any other marble started out as clay layers – the same as the dark stripes in Eramosa. But typically when a rock undergoes metamorphism, it gets compressed, buried deeply, and pushed, pulled, and twisted along the way. That’s what gives marble the flowing, taffy-like swirls of color. But Olympic Striato doesn’t have any swirling at all. Its stripes are perfectly flat, just as they were when the rock was originally laid down as layers of limestone and clay. There are two ways that could have happened. The first is that the stone was compressed perfectly evenly, squeezing the entire area at the same rate, the same amount, and from the same direction. That seems pretty unlikely to me, but I suppose it’s possible. Another explanation is that the rock became metamorphosed from heating alone, without much compression. This happens when a body of molten rock sidles up to a sedimentary rock, heating it up. This can occur when a pocket of liquid magma bubbles upward within the Earth’s crust, like a blob of lava in a lava lamp. The molten rock heats anything nearby, baking it into a metamorphic rock. The geologic name for this is contact metamorphism, because just being near the hotter rock causes the metamorphic effect. This is not unlike the related term contact high, wherein the effects of a drug are experienced by nearby onlookers. Iron Red granite. Photo courtesy of Brasigran. There are two astonishing things about Iron Red. The first is obvious: look at that thing! 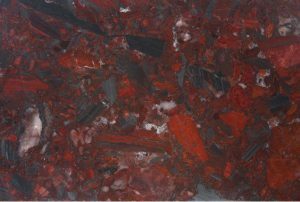 A moody mixture of deep red and metallic black, alternating in thin layers. The vivid stripes can be relatively straight, or swirled up into patterns befitting of a heavy metal album cover. This stone is not subtle, nor is it for everyone. But if you want something that stands out from the crowd, Iron Red might be your match. Equally compelling, to me anyway, is the geologic story of Iron Red. This stone is so unique and well known, that any geologist or geology student will instantly recognize it. It’s the signature of a specific time in Earth’s history, seen all around the world’s oceans at the same time. Iron Red marks the first time in Earth’s history that there was abundant oxygen in the atmosphere. You may remember from 6th grade science class that the early Earth did not have what we would consider to be hospitable conditions. The atmosphere was rich in carbon dioxide and methane, and had no oxygen. Early life forms called cyanobacteria used photosynthesis to take in carbon dioxide and breathe out oxygen as their waste product. They did this happily (actually I do not know if they were truly happy, but I like to imagine they were) for a casual billion years or so. Around 2.5 billion years ago these cyanobacteria had exhaled enough oxygen that they essentially polluted their whole environment. Oxygen built up to the point where “suddenly” (geologically speaking) the balance was tipped and the oxygen combined with iron in seawater. This formed iron oxide minerals that sunk to the bottom of the ocean. Worldwide, a layer of metallic iron oxide settled to the ocean floors, clearing the air of extra oxygen and allowing the cyanobacteria to thrive once more. But the oxygen built up again, caused another dose of oxidation in the oceans, and the next layer of iron oxide accumulated. Each cycle created a new layer of iron oxide, followed by a layer of sand. The dark, sparkly layers in Iron Red are the iron oxide mineral, hematite. The red layers are jasper, which started out as sand, and became metamorphosed into solid silica. Jasper’s red color comes from the iron. Most rocks like Iron Red are not used as decorative stones, but rather as iron ore. They are the richest source of iron in the world. Iron Red comes from a productive mining province in Brazil called Quadrilátero Ferrífero (which translates to “iron quadrangle”). This iconic rock is also found in the Iron Range around Lake Superior, as well as in Australia, Ukraine, South Africa, Norway, and India. Geologists call it the banded iron formation. One caveat for designing with Iron Red is that it will rust in wet locations. It’s not the best idea to use it outdoors or as a shower or sink basin. 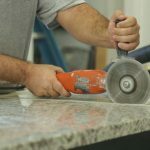 The stone is also notoriously difficult to fabricate because it is hard and dense. It will wear through cutting tools, and the work can only proceed slowly and patiently. Fabrication will cost more and is best left to a seasoned fabrication shop. But in the end, you’ll have something that is both visually and geologically unique. Unlike granite or marble, which continue to form today, the banded iron formation was a one shot deal. It only formed during a few episodes in Earth’s ancient history, and it can’t happen again. Now, there is too much oxygen available all the time, so it can’t build up in a big dose like it once did. Beyond the stunning colors and intriguing history, lies another lesson. Earth is a complex balance between the atmosphere, oceans, land, and the life that inhabits it all. Seemingly small life forms have the power to change the course of the entire planet. That’s something worth thinking about as we ponder our own mark on the world.